The Internet has brought us so many wonderful gifts. It’s given us the power to connect with family members in faraway places, the ability to ask almost any question and receive an answer, and now, it’s brought us dinner. Restaurant delivery sites seem to be popping up all over the place. Just yesterday I saw a television ad for Seamless. Seamless is a single website that allows users to search and filter through restaurant options in their area, place an order, and have it delivered straight to their door. When I saw the commercial, I had to immediately check the site out. As I curiously wandered throughout the site, I realized that several of the concepts used could be very easily translated to any ecommerce site. I then wondered how many other restaurant delivery sites followed a similar pattern. In this article, I will discuss my findings on three restaurant delivery sites: Eat24, HungryHouse, and OrderUp. These sites place emphasis on usability and customer service. Can you think of anyone else who could benefit from qualities like this? If you are an ecommerce owner, I hope you had a major “eureka!” moment and said, “My business!”. If not, we’ll just pretend you did. Let’s see what else these sites are doing right, and how you can follow their example. I know I’ve mentioned this in the past, but the more design clients I get, the more I find myself repeating it: your site needs a prominent call to action. Eat24 does just that. 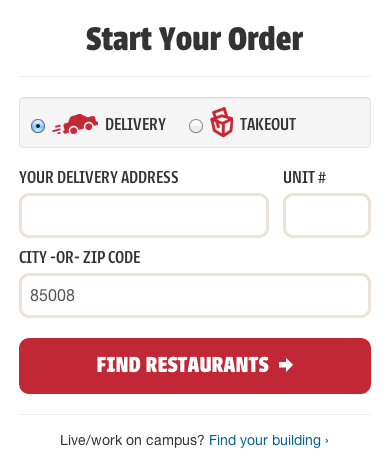 The moment you land on the homepage, it is very clear that you should type in an address/zip code and hit the big, red “Find Restaurants” button. 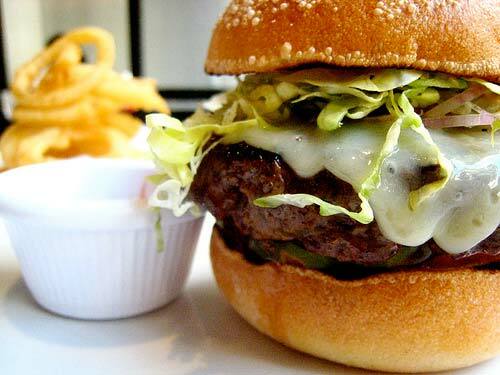 From there, users are taken to a page with all of the restaurants that deliver to their area. In my case, the search yields over 50 results! For a picky eater, this could seem like a nightmare. Why is it so difficult to find a good pizza place within 3 miles of my location? Enter filters. Let’s use Eat24’s filtering system for this example. By clicking a small link that says “OK, let’s get serious” users have the ability to filter by delivery or pickup, distance, cuisine, features, price, payment type, and time. With a few clicks of the mouse, I now have 5 pizza restaurants that offer free delivery, are within 3 miles of my location, are in my budget, and will take a Discover card. Why can’t everything be so simple? It is no news that more people than ever are using mobile devices. With this in mind, it simply astounds me when sites that have been built within the last few years have almost no consideration for non-desktop devices. 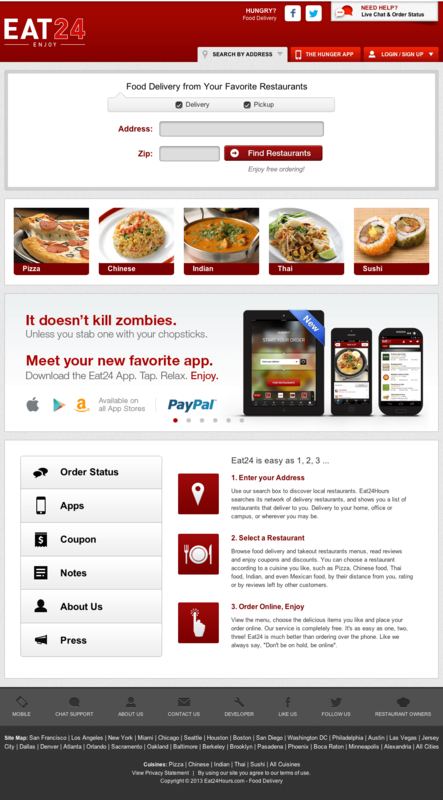 Eat24’s mobile application and mobile site handle this issue beautifully. Each allows the same user-friendly filtering and checkout process as the desktop site. Hungry House also has a mobile application available for its users, and OrderUp offers a separate mobile site. I must admit, I did review these sites around lunchtime, so I may be a bit biased, but the pictures look simply delicious. A picture is truly worth a thousand words. If your current site has product images that look terrible (for example, they have your thumb in the corner, obstructing the view) it may be time to revamp your site with more professional, descriptive images. The checkout process for each site is nearly identical after that. Once I’ve selected a restaurant, I’m taken to a page with the full menu, complete with – you guessed it – more filtering options! I have several filtering options on each site to choose from. From there, I can sort by rating, recommendation, and price and can filter my choices by what is popular, spicy, vegetarian, or by which items have photos. There is even a “My Usual” option on Eat24’s site to aid returning customers in making a speedy purchase. Adding, removing, and editing items in your cart is very simple, and making specific requests (like “no cheese, I’m lactose intolerant”) is a breeze. Even the most user-friendly sites can’t always design for the lowest common denominator. 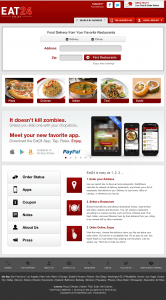 To solve problems they can’t foresee, Eat24 and OrderUp both offer chat support for their users. Just like product images, reviews are immensely important. Think about the last time you used a service like Yelp. If you are like me, you really don’t visit a restaurant before doing some research first. Nearly every time I look for a new place to try, I am influenced by the online opinions of strangers. Now take a look at your ecommerce site. Does it have product reviews? How might they influence a potential client? As if I needed any more reasons to have my food delivered straight to my door, each site has a section and filter just for specials and deals! I’m a sucker for a coupon, so my chances of making a purchase just became a bit stronger. One of the most important aspects of any ecommerce site is ensuring that your user can buy with confidence. If a user feels unsafe on the site, they may be unlikely to carry out a purchase. By including logos that verify your site for safety or reliability, you can help to put their minds at ease. For example, HungryHouse’s footer provides logos with awards, associations, and even credit card companies. Finally, I’d like to discuss how these sites appeal to our emotions. First of all, food falls into the most basic of requirements according to Maslow’s hierarchy of needs. People need to eat, that is obvious. 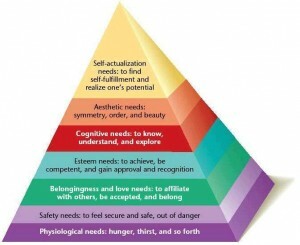 As the pyramid narrows, we encounter more emotional needs. In Designing For Emotion, Aarron Walter discusses how using fun language or exciting color schemes makes users feel more comfortable, and thus more willing to complete the desired action. 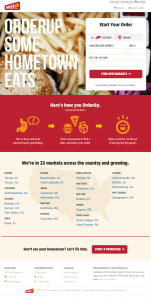 Eat24 encourages users to fill their shopping cart through personification. Notice anything? They each have varying hues of red! Red has been proven to increase enthusiasm, stimulate energy, encourage action and confidence, and even incite hunger. 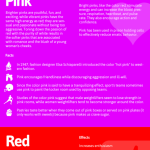 Check out the infographic below by SensationalColor.com for more information on color theory. My intention is not for you to read this article, and begin your own restaurant delivery website. My intention is for you to find inspiration for your sites in extraordinary places. In a recent post entitled “3 Ways to Make your Site Stand Out from the Crowd”, Paul Boag encouraged designers to “Stop designing websites.” He went on to explain that web designers often struggle to find inspiration because they limit their creativity. You can absolutely find inspiration in places other than the web, but this may be too much of a leap for some of us. My suggestion is to start small. The next time you design a site, check out some websites that are in completely different industries than that of your client. See what works for them, and what could work for you. By expanding our inspirational horizons, we open up the floodgates to creativity! Does your ecommerce site need professional analysis and expertise? Contact us today for a free consultation!